JVC TH-W513B review | What Hi-Fi? Since the flat-screen television became ‘a thing’ (a couple of decades ago now), one of the major complaints about them has been their relative lack of competence when it comes to sound reproduction. You can’t blame the poor old TV, really. It’s unreasonable to expect a full, dynamic, lush sound to come from what is, by definition, a relatively svelte body. The bulky CRT TVs of the 20th century, by contrast, had plenty of room to accommodate substantial speakers – and were clearly superior as far as audio goes. Inevitably, it was really only after the CRT started to disappear that the discerning television and video viewer realised just how much good sound improves the movie and TV viewing experience. Enter the soundbar – a product, like so many we review nowadays, that was unheard of 20 years ago. Soundbars today, along with the soundbases that have followed them, have (over time) become more and more sophisticated, more and more complicated – and therefore, of course, more and more expensive. Now you can invest big money in a superb soundbar that will give you Dolby Atmos, ‘surround' sound, huge bass via a subwoofer, and all manner of input and streaming possibilities. The JVC TH-W513B isn’t one of those. This £60 unit, a Currys exclusive in the UK, is a bit of a throwback to the original idea. It’s inexpensive, and pretty much its sole purpose is to boost a TV that struggles with sound reproduction. And it does so rather well. Take it out of the box and the JVC impresses with its build. It’s made from an unremarkable black plastic - but for the price it’s reassuringly hefty, and nicely put together. That unobtrusive nature extends to its dimensions as well, and you should have no problem siting this slim, 80cm wide unit underneath a TV on a stand. 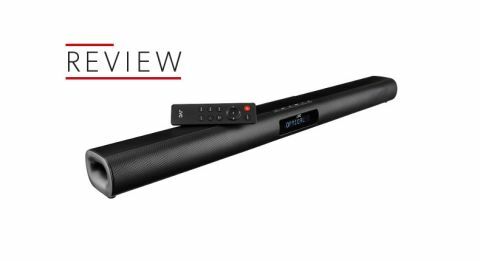 Plenty of rival soundbars fail the line-of-sight test, so it’s nice to have a piece of kit that you can just plug in and play without having to worry about shifting other furniture about. There is a bracket supplied in the box for wall-mounting, should you need it. Also supplied is a remote control handset, a 3.5mm-to-3.5mm cable and a digital coaxial cable for connecting to your equipment. The one thing missing is an optical digital cable – which is a shame, as this is a method of connecting to a TV and other equipment many people will want to employ. In a small nod to true modernity, though, the JVC has Bluetooth connectivity should you wish to play music through it from a mobile device. Set-up is reassuringly simple, too. The unit sits on little plastic feet in front of your TV. Connect your TV or other device via coaxial or optical digital cable (or 3.5mm input if that’s your only option), plug in the power, push the button on top of the soundbar to select the relevant source input, and away you go. Nothing more is required. There is an adequately sized display in the middle of the bar to show input and volume level - it can be set to show the time when the unit is in standby. The rather nice (for the price) remote control will switch inputs one by one, adjust volume, mute the bar, and allow you to select one of four pre-set sound modes. We stick the JVC TH-W513B in front of a 65in 4K Samsung TV – to be honest, not its natural habitat. Nevertheless, it puts up a decent fight. It certainly puts the Samsung to shame as far as outright volume is concerned. Initial impressions, though, are of a somewhat bass-light performance in comparison to the TV. Once we start fiddling with the four sound modes, though, the little soundbar ups its low-frequency game a touch. The default sound mode is quite flat and a little tinny - the other options are ‘TV’, ‘Sport’, and ‘Movie’, each one of which tweaks the soundstage a little. We find ‘Movie’ provides a more well-rounded overall spread of sound, while still allowing voices to come across clearly and convincingly. ‘Default’ is probably the least impressive option of all for us – so it’s worth having a play with these presets, rather than just settling for what you get out of the box. Despite its best efforts, matching with a premium 65in screen is really not what this soundbar is built for. Stick it with a smaller TV and it really starts to prove its worth – its abilities quite easily outweigh the sonic efforts of the TV alone. It’s true that things get a little strident if you really turn the wick up, with treble too much to the fore. Bass is, not surprisingly for such a slight bar, lacking – but it delivers welly most affordable TVs can’t approach. And speech comes across clearly, whatever the sound mode you choose - it is quite obviously more easily distinguishable from the background noise than the sound from the TVs we use. To be honest, we didn’t expect a huge amount from the JVC TH-W513B as we were taking it from the box. But this little bar will easily, and cheaply, boost the sound of many TVs up to around 55 inches. It’s by no means perfect – but it's yours for just £60. When we asked colleagues who didn’t yet know the price how much they thought it cost, they consistently guessed at around twice the price. You can’t say much fairer than that. For the price, this little JVC bar is a bit of a bargain.